Given that adding space between the lens and the mount acts as an extension tube, it begs the question: How do you prevent losing infinity focus? Obviously it's only going to work with cameras that have FFD to spare. Such as mirrorless. Professional cine cameras usually do. shouldn't this have been released on April 1st? Good that Mr. Kerr picked up the old idea from the French camera manufacturer 'Beaulieu'. They hat a 16mm model with a three lens turret. Pretty reliable technology and quality. Wouldn't it be simpler to add a separate sensor for each lens? rather than rotating the mass of the turret? This would eliminate the mechanical stuff, and fix the lenses; and just (elecrtically) switch from one sensor to another. Just common sense to me. LOL, reminds me of the studio television cameras of the 60's. * ’60s *, that is. Why are you all so against this? It's not stolen tech. It's also not new, but what is new is it can be mounted to new Sony cameras. All ideas have a foundation from another person's ideas. Adding to is how devices keep improving. It would be similar to not allowing any other company to patent or sell portable computers because Osborne was first. We all can look at that today and see it would be ridiculous to say that because that "portable" weighs more than most desktop computers today. The improvements that one person can make to another's devices are really great for the end users! Yes, it will get a patent and should be. Probably hard to patent something that was commonplace in the 50's, if not earlier. But the US patent system is broken, so yeah, they probably will be granted a patent. I'm against this because it's dumb turret and the "inventor" didn't even bother to add switchable electronic communication between the lens and bodies. That would need a little more than dumb mechanical design but still you could come up with a solution in 10 minutes based on existing rotary switches. Sure it's marketed to cinephiles who don't need no electronic communications but as long as you have EF lens then you can't control aperture manually and the other system compatibility suggest it's not only for cine lenses. The article doesn't provide specific information about what is being patented. A lens turret in itself is not new, so any patent claims the inventor is making will be much more narrow -- perhaps on the specific mechanism of how light leaks are prevented or how the focusing is accomplished. That said, just because they filed for a patent doesn't mean they are going to get one. The US Patent Office doesn't just grant a patent if an idea is merely new. The idea also has to be one that is not "obvious" to someone skilled in the profession. For example, the inventor might claim that the invention is the first turret that uses gaskets to keep the turret water tight. While it may be the first to do so, it is obvious that gaskets can accomplish this and no patent will be granted on the invention. The US patent term is only 20 years, isn't it? Turrets haven't been popular for decades, so they will have lapsed. The 1938 Bolex H8 already had the turret system but I don't know if that was the first. The Rectaflex Rotor appears to be the first to do this on a 35 mm Full-Frame SLR, so it's a direct comparison regarding the larger 24 mm x 36 mm film/sensor area. TV Studio cameras used to use a similar system, as do microscope lens turrets but this is not really comparing 'apples with apples'. The Rotor came out in 1952 . On another thread I posted a photo of a mount made for Leica in 1940. I found this article. It seems they ere made between 1949 and 1951 and it's a bit crude in operation, limited in the lenses it could take and made film loading on a Leica a bit (more) problematic. Leica produced their own version for the M series in 1960. Yes sorry, that was a typo. It was meant to be 1949 not 1940. Still , it was before the Italian job. I like the idea for the convenience of not fumbling around in my bag and holding two at the same time while switching, but perhaps a tad cumbersome with my 10-24, 18-55 and 55-200. Imagine carrying this around a small town fair. Automatic center of attention. Probably reported multiple times by Joe Public. Unfortunately with non-diverging mounts it's only going to work with lenses of similar lengths, otherwise the longer lenses will be seen by the shorter. I have old days video camera with rotaiting lenses in front of it. 3 to be exactly. So what did they patented? Ability to change lens without using lens bag/case? Patents are not awarded on general ideas but on small details that make them different one from another. Super 8 with turrets? I only remember S8s with zooms. 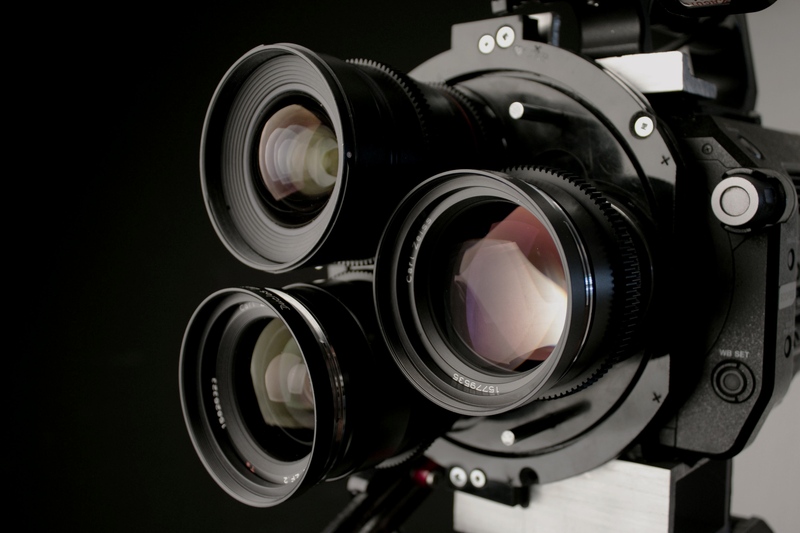 On Double8 however, they were common (until zooms made them obsolete), and even on 16 mm cams. As a sidenote: on M43 such arrangement, with small MF lenses, could well be worth a try. The whole idea of MFT is (was?) small and light. Imagine now, the same camera, with a phone sensor, which are the sime size than a 8mm film, all the computational tricks and you have a cool modern digital vintage camera. 👍🏻 - Hmm, yes, I would also add the weight reduction... 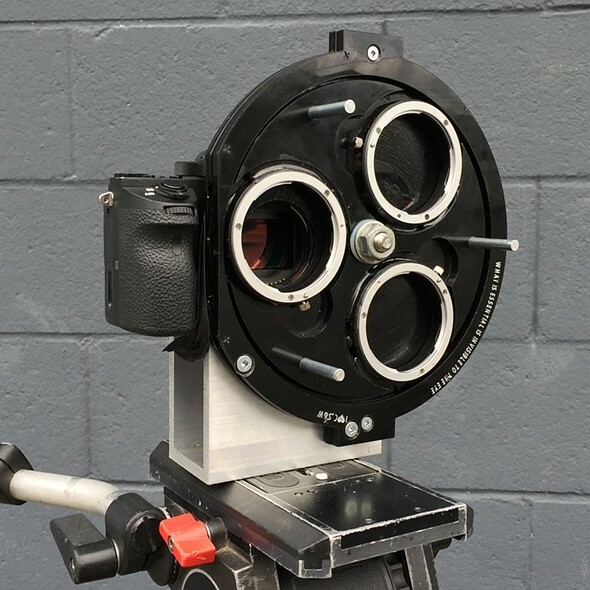 Imagine a slot for the turret with the 3 (relatively small) lenses...on the back of an iPhone! Real problem, since by immutable law only one model of any design is allowed to be manufactured. 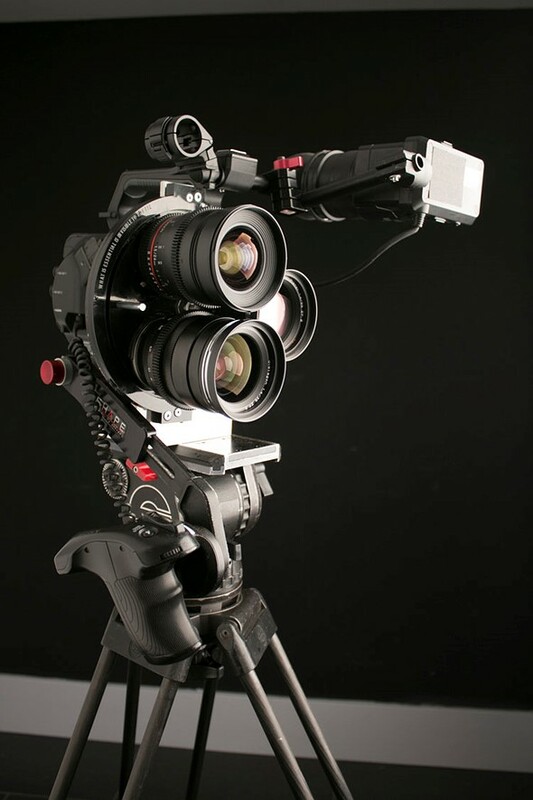 They could make a mini one to hold the complete Apexel 10 lens kit for smartphone. Eat your heart out, Huawei P30 !! Blast from the past. Love it! All those times when I change between two bodies to be able to switch between lenses quickly, this would enable me to use one body and probably change faster. How quickly we forget. Arriflex IIB had a 3 lens turret and even Kubrick used it....among many great directors/cinematographers. Probably they did not patent it. Yet another proof of uselessness of modern patent filing system where anything will be patent granted as long as you paid filing fees. They registered it with USPTO. That doesn’t mean they have received a patent. If there is prior art then no patent will be granted. Don't think this has anything to do with patent. 2-lens turret on Eclair NPR. Everything new is a well-forgotten old. But the idea is a very healthy one! Excellent, excellent! This allows you to shoot from exactly the same position. In a movie, you would notice the switch between multiple cameras side by side, even if they are off by just a few cm. Add three more mounts and you can play Russian Roulette with it. For those that aren't aware, this isn't a new idea, but imo, it's good to see it back. Besides the digital thing, and the implication that this would be sold to the general public, or the public using pro-level video cameras: How is this significantly different than a multi-lens turret for TV studio cameras from the 1960s and 1970s? Thank you for "confirming" your "extensive interest in and knowledge" of camera gear. Except in the 1980s, 1990s, and especially the 00s, saw vast improvements in zoom lenses for video cameras. This is a brilliant idea!! On a S35 camera just put a Canon 10-18, a Sigma 35 ART and a Canon 85 1.4 IS, and go shoot a film! How do you attach a matte box or filters and a lens shade? What kind of follow focus would work? 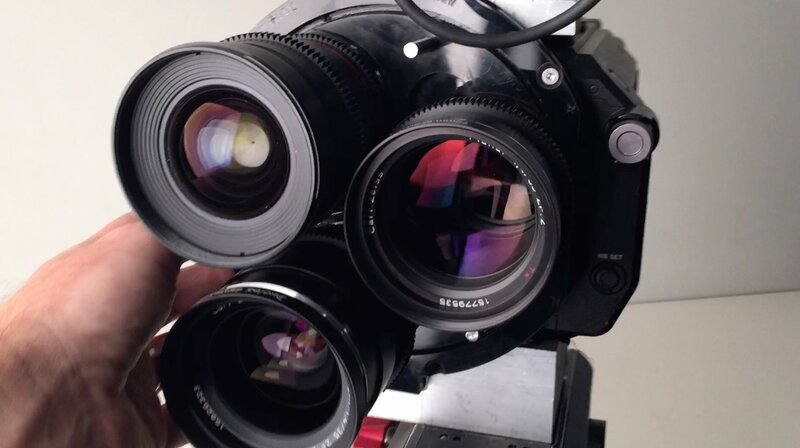 This was not a bad idea...when prime lenses were much smaller, but turrets were converted to "Hard Front" when lenses became larger, heavier, and faster. Flange depth is super critical on sensor based imagers so adding a mechanical turret would only increase potential problems. There are plenty of excellent sharp and fast zooms that will give you better results. I smell a new trend for wedding photographers. Anyway you better only use primes on it. Can you imagine mounting 3 Sigma zooms on this thing? Also better not use this anywhere near a warzone. I don’t see this working with tele and wide-angle combined. The tele would be within many wide-angle’s FoV. A better option would be vendors move to lenses with digital endcaps, including the sensor stack. I hate to bust anyone's bubble, but an ultra wide lens on a turret is going to see any other reasonably long lens in its periphery. The idea is even older than this - some darkroom enlarger had the option to use a turret for up to three enlarger lenses each for a a different negative size. The first ever 35mm prism'd SLR (well equal first anyway!) the Italian Rectaflex in 1947 had that exact factory option. This is for film industry. But ... they already have it? Awesome; I'll stick the 11-24 on the first pedestal, then a 24-105 on the next, and then finally the 100-400 mk2 - reasonable IQ and 11-400 range. I hope the backs of the unused lenses are automatically "capped" when not in use? Better they invent camera with three sensors . The images could then be combined in the camera to produce a picture without noise and with good dynamic range. It will be something like hdr but with all pictures taken in same time. Just because some phone manufacturers do that, doesn't mean it's useful for actual photography. That's an original invention, circa the 1930s. The next invention will be a camera that takes film to go with it. The USPTO obviously encourages a great deal of recycling. No, the USPTO encourages filings of patent APPLICATIONS, and then those APPLICATIONS are checked to see if prior art already exists. If it does, which seems likely in this case, then the APPLICATION is rejected. If no prior art is found or the APPLICATION is truly for a new thing, then the APPLICATION is accepted, and the inventor is issued a patent. Regardless, that is the USPTO doing its job. That's easy, the next one will make turret that allows for electronic communication, making this patent obsolete. Why? Videographers are likely already carrying all three primes plus the camera. This simply adds the turreted mount, probably a couple of pounds (1kg) at most. Ian Kerr - "he, who has registered the design" - probably dug up something like this while cleaning out his grandfathers attic mounted to a 16mm Bolex. at least that is what i have lying around.